In some rare situations, reinstalling OS X on a Mac may be required. This is made fairly easy as all modern Macs include the OS X Internet Recovery feature, which lets you reinstall OS X through a netboot type of mode that is accessed from the internet rather than a local drive. This is helpful in the event you need to reinstall Mac OS X whether for fun, because something has gone truly haywire, or because you need to replace the system software for whatever other reason. To be clear, we’re going to focus on Internet Recovery here, but there are actually two modes of system recovery; one of which is based on a local Recovery disk partition, and the other which is called Internet Recovery, the latter being triggered if the Mac does not have a Recovery partition found or if booted directly into as shown in this walkthrough. Both of the recovery modes let you re-install OS X, but the version of OS X that is installed onto the Mac will be different depending on the type of recovery mode used. Specifically, the Recovery HD partition will re-install the most current version of OS X that is currently installed on the Mac, whereas Internet Recover will re-install the version of OS X that originally came with the Mac. That difference in how the two features works means you could theoretically use Internet Recovery to downgrade OS X to the version that shipped with the Mac, though there are better ways to do that if you have a Time Machine backup from the prior OS X release handy. Note: Re-installing OS X is typically only necessary when something is seriously wrong with the Mac system software and the computer is not functioning as it should. Do not attempt to use recovery mode for reinstalling unless you have made a thorough backup of your important files beforehand, doing so without a backup may result in irreversible file loss. You can always start a backup with Time Machine before if you need to. This guide is simply going to cover how to start a reinstallation of OS X with Recovery mode, and not the other options available when booted into recovery. Internet Recovery requires internet access, that may be slightly obvious but it’s worth mentioning because if the Mac is unable to connect to a network then it will not be able to download the operating system. Whenever possible, you should back up the Mac with Time Machine before attempting this. You’ll notice the version of OS X that can be reinstalled this way is shown in the icon or listed under the “Reinstall OS X” option, and that version will match whatever version of OS X came preinstalled on the Mac. For example, if the Mac shipped with OS X Mavericks but is now running OS X Yosemite, then OS X Mavericks would be the version that reinstalls through the Internet Recovery reinstall process. For Macs that do not currently have an operating system found or installed, the option will show as “Install OS X” rather than “Reinstall OS X”. 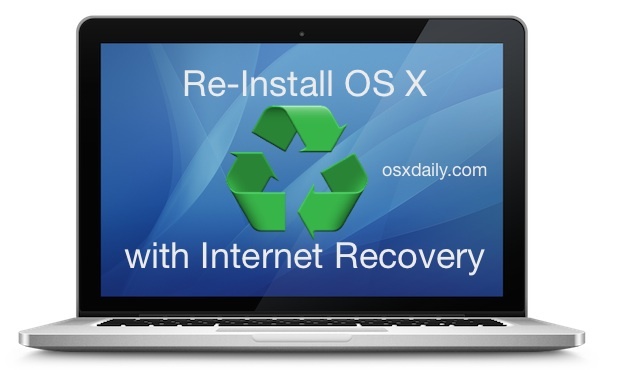 Installing and re-installing OS X through Internet Recovery is pretty easy, but do be aware that because everything is coming from Apple servers, it can take quite a while as the system restore features are downloaded locally, and then the version of OS X to install are also downloaded locally as well. When OS X has finished installing on the Mac, it will boot into a fresh install of OS X system software. Do note that if you are reinstalling OS X to try and repair some greatly messed up operating system install, you’d likely be better off performing a true clean install of the system software by formatting the drive and then installing OS X onto it (or another drive). If interested in going that route, you can learn about clean installing OS X Yosemite, or clean installing OS X Mavericks, both of which are best performed from a separate boot drive or bootable USB installer. * You can also use Command+R to boot into Recovery mode, older Mac models that do not support Internet Recovery will need to do that. Note that newer Macs that have both options can choose either, or they can can skip the recovery drive and go directly into Internet Recovery by using the Command+Option+R boot shortcut. I prefer using a USB key to reinstall Mac OS X (basically like the clean install you described), but Internet Recovery is so easy if you have broadband that it’s a great option. For anyone wondering, you can also use Internet Recovery > Utilities > Disk Utility to format the destination drive and do a full clean install, or simply reinstall JUST the operating system of OS X. It’s a workable way to downgrade from Yosemite to Mavericks or Mountain Lion if the Mac came with it… but yes indeed backup first because I have seen it go wrong before! Reinstalling OS X this way is fine, so is installing OS X this way. Downgrading with Internet Recovery is not a good idea at all. I get a kick out of the second part, accurate. I agree! It showed the globe and says “this will take a while”, then it goes into a blank screen with the apple in the middle, 3 hours passed by now nothing changes! Hi Jack, Ive been having this issue where first of all if I just boot the imac, it just keeps restarting over and over. If I try any of the startup options such as command+option+R it goes into internet recovery progress bar then goes back into the apple logo progress bar then stays on the grey/white screen. Like you said here, i just held alt and it allowed me to choose my network then I hit “recovery” and it did the same thing….any ideas as to what I can try next? This seems to happen no matter what startup commands I try. I dont care if everything on the computer gets deleted I just want to get this thing working again. Did you ever find a solution to this? I’m in the exact same boat. Hey, mine’s doing the exact same thing. Did you find a solution to this? Stressing out! Hope I never have to recover from an OS X failure, but it’s good to know this beforehand. I have used recovery partition several times, and it is relatively slow (on WiFi), but infinitely useful way to fix serious performance issues. What is rarely mentioned in these How-tos is a somewhat unique thing with OS X versus Windows. Every time I have re-installed Windows, I have had hours of work to re-install apps, settings and documents (maybe it is better with Vista/7… but I gave up on MS long before these). With OS X, reinstall does not reformat the drive, rather it leaves /Users/… and /Applications/… untouched. Therefore, once the operation is complete, you pick up where you left off, all apps and settings and docs are right where you left them and no Restore from backup is needed. One day at work I found a Macbook Air in a recycling box. My boss let me keep it, if I made sure I wiped it clean. So I arrogantly booted it up, showed it to him, and did internet recovery. He said “if microsoft did this our job would be so much easier…” he’s right. wow, a great article and easy to use. Would this style work in this case? if someone upgraded Mac machine in terms of RAM and few apps to ease the work then the Re-installed OS X would come bare or along with the apps? This is not a walkthrough on downgrading mac, this is a walkthrough on using Internet Recovery to reinstall OS X that came with the computer. After #3 above, I have a grey screen, and it’s sitting at wifi sign-on, where my username is showing and the dots for where I put in password and hit the check mark, so now after hour see spinning gear to right of password box and wifi bars are full–does this mean it’s downloading or installing? Or has it not taken my password? I see no horizontal progress bar, only spinning gear there. I got to the reinstall Os X part of this and it keeps rejecting my password even though I know it’s right. Any reason why this is happening? I have got macbook pro early 2011 model. Initially it came with Mac OS X Lion. Later on I upgraded it to Mavericks. found out that it is encrypting my whole hard disk. I left it for hours and hours but it looked like it stuck on that process. system I used Power button and did that forced shut down kind of thing again and since then it is not turning back on properly. it keeps going to safe mode. From safe mode I tried to restart the system but since then it stuck on Grey Barred Circle thing. I decided to use Internet recovery method when all other methods failed including safe mode, pram reset, single user command. You just need to erase the hard disk. Hi, I messed up when attempting to revert from Yosemite to Mountain Lion via internet recovery. Instead of re-formatting (if that is the right terminology) my macAir, I accidentally selected my external time machine hard drive (ouch). a) Do I add a new partition? (a 2nd one)? And afterwards delete the 1st partition? At present that is one of the few things I can click on. I followed the steps in this article and sure enough I got to the point where I had the option to reinstall and the OS offered was Mavericks (the one which came with the MacBook Pro. This is what I wanted: Downgrade from Yosemite to Mavericks). Now when I click it says “You cannot install this on a newer operating system”. However, since I have a second partition for my file storage separate from the system partition I clicked on that and it is now installing. Question. Once if it installed can I just erase the partition where I have Yosemite and get rid of it altogether so I just use Mavericks or it would be better to keep both and dual boot? i have done this, although once i try to reinstall OS X is says that it is not availiable and to try again another time.. what do i do then? I am receiving error code 1007F when I try Internet recovery, is there anyway I can get past the startup issue where I’m getting the flashing question mark in a folder, without using Internet recovery? I have same problem any help? I have followed these instructions and successfully get to the point where I can reinstall Lion. However, while installing, the progress bar will get down to “About 1 second remaining” and then jump back to anywhere from 45 to 32 minutes remaining. This process has repeated itself several times. Any ideas what to do from here? Thank you. I tried installing and when I selected Macintosh HD it said “the disk is locked” and would not let me proceed? Do I have to put in a disk to reinstall mountain lion or should something come up that I can choose from? I am receiving error code 1007F when I try Internet recovery, is there anyway I can get past the startup issue where I’m getting the flashing question mark in a folder, without using Internet recovery? What goes in box with WiFi or antenna next to it? And what goes in box with lock? What do I click on check or enter..no info on this shift and r right at startup…???? That’s bs. I went through Internet Recovery on my mid-2010 MBP, which came shipped with SL 10.6.3. After updating Lion from 10.7.4 to 10.7.5, I had to REINSTALL the entire OS, when the machine refused to boot back into the desktop. But Internet Recovery is insisting on installing the God-awful Yosemite… not the Snow Leopard, that I want and that it came with! Mac OS X Snow Leopard did not include or support Internet Recovery, so it would be impossible to restore an operating system to the Mac which never included the feature. In those situations, the most recent version of OS X available will be recommended by Apple to install. Personally, and you can say this is anecdotal, whatever, but I would not recommend installing OS X Yosemite in it’s current form on a 2010 model year Mac, it really belongs on Macs from 2014 and newer hardware, it is not well optimized to run on systems with lesser resources. I say this with experience from extensive testing on many Macs of a variety of capabilities, and I’m at the point where if the Mac does not ship with Yosemite installed, I would not install it. OS X Mavericks is quite good, and is at least optimized for most hardware. On a brand new Mac, OS X Yosemite runs quite well, however. Fortunately, most 2010 Macs came with physical reinstall DVD volumes of Mac OS X Snow Leopard, so you should be good to go with that. You can’t be serious, of course you can’t install OS X without a hard disk. Could a car run without an engine? It would do nothing. Install a hard drive, how are you supposed to re-install OS X without a hard drive? Where is it going to go? That’s like trying to walk in the air. Get it together. Be Kind.. it seems there is a communication issue here.. he states that “MAYBE it was removed – but then states it left 111 gb left” (meaning he doesn’t really know) if i were to analyze this.. it seems he just needs to run disk util and maybe repartition. at least go to disk util and see see exactly what HD he has..
Or maybe he doesn’t understand computers. What are you, 14? Don’t be a jerk. Moses. connect machine to internet and restart holding command+R – this will (should) start in system recovery which will give you Disk util and “Reinstall OS” option – Note that this will install the OS that the Recovery part was created with. I’m resurrecting a MacBook pro that had a failed HDD but no OS disc etc. Replaced drive and ran Internet Recovery, task bar showed that took about 4 mins (lan connection), but after, the Mac screen showed Apple logo for a few moments, the spinning dots for maybe 5 secs, then goes and sits on a blank/lit screen without any menu option. Any suggestions as it’s been sat like that for an hour at least. I don’t know if it’s running anything in the background or just hung. When trying to reinstall OS or basicly do anything else, my Mac cannot find a disc. I have nowhere to install it to. Charlie23 im having the same exact issue. Any luck? I’m trying to re-install OS X on a mac mini currently running Yosemite 10.10.3 from the built in recovery partition. I have erased HD, de-authorised from iTunes and signed out of iCloud in readiness to sell the machine – however it is only re-installing Mountain Lion – which is the version of OS X that came when purchased. Any idea why? what if i can’t get onto internet recovery?? i have wireless connection available but it doesn’t want to go into the actual internet recovery. I went and reset my MacBook Air, and then i went to access the internet recovery bit, the bar started loading up, and about 3 quarters of the way it stopped and said 200F apple.com/support. as i said i have full internet access, it just refuses to download the OS X from the internet. I’ve gotten thru all the step and when it ask me to select a disk to install Mac OS X Lion to, there nothing in the field box to select :/ any ideas? Me too….not seeing an answer to this. I’ve wiped my computer before, but I don’t recall these menus. I have erased my Macintosh HD hard drive, and don’t know the next steps. I am running a mid-2011 iMac with 16GB of RAM and a stable internet connection. Good if your internet is stable, turn it on while holding the command and R key for internet recovery mode. This will take you to the OS utilities where you will download the os from your mac directly from the apple servers. Would this work on my iMac A1312 owned since September 2010?? Have basically done a factory reset, just need to reinstall OS. Hi, so I wiped my Mac hd due to some problems with performance etc. after wiping the hdd I clicked the reinstall OS X and got the message saying cannot locate your computers information. This meant that I couldn’t reinstall the OS X. I turned the Mac off and on again and tried to go back to the recovery menu using command+R but it only goes it internet recovery mode. From there I try the internet recovery and keep getting error code 4403f. Now I’ve read that it’s related to the ISP or router firewall, but I’ve not found a way to solve this problem. Therefore I’m stuck with the situation wher I can’t reinstall or recover the OS X from the Internet and I can’t get back to the original recovery menu from before. Any idea what to do? I will if necessary take it to a licenced repair shop but I’ve read it could cost anywhere from 50-150 USD which is a bit much to just reinstall the OS X.
I erased my HD drive. After that installed mac os. After some time its giving error 4403f. Tried on my office WiFi. I got a mac Book Pro with os x maverick and i erased the files at the utility without backup of the apps. am trying to reinstalled the maverick but i keep receive a message that is not available any time i want to reinstalled after logged in to apple account. after while i did a bootable usb on a pc with a mac os x yosemite but my system not recognise the bootable usb. Please how do i make it work again. Using Internet Recovery I could tell it went through the download. After that I got the centered apple logo, then back to blank white-grey screen. The reason I went with this recovery option is that I cannot go into Command+R to get the OS X Utilities. Ugh. Oddly, 3 hours ago I was able to. Now every process I have been reading about and try gets me back to the white screen. Edit: When I earlier was able to access utility, no disk errors were found. I also tried the “fsck -fy” option in terminal mode and seems like there were no errors. So odd…. Does anyone know why I cannot install from disk? I boot and press C, moves to Apple Logo and get the 3 beeps. Have changed Ram and the only way that leads me somewhere is the alt,cmd p option and I dont get the 3 annoying beeps. I ereased my new MBP retina 2015 and it only boots to internet recovery and I have my USB disk bootable with yosemite . I have tried to reboot using recovery mode but still getting a white screen – Any ideas? I formatted and quit at that wrong time, I used opt+com+r and get the globe. after that the apple, then nothing. So has ANYONE one this thread figured out the problem? I restart my computer using all the option/command/R stuff but get a spinning globe that never connects to my internet. I read somewhere else that it could be my internet and that I should try a restaurant or internet cafe? I really don’t want to spend $75 for apple to do it. Got a White macbook late from mid-2011. Came with snow leopard. Had to change hard disk. -Using Command+R to install OS-X doen’t work. -It proposes to “Reinstall OS-X Lion”. -When I click on it, it says “To dowload and restore Mac OS X, your computer’s eligibility will be verified with Apple”. -I have tried several times and it’s not working. Can someone help? Thank you! After reading many blogs and many hours of troubleshooting, like always, comes down to the simplest thing. When doing this OS X reinstall, you have to be connected via wire to the router or modem directly. You will have issues via WIFI…. Oh and this was recommended after an hour with Apple Care, very nice technician and very helpful as always, not sure why everyone else talks bad about Apple Care, they are always helpful to any issues i had. I have reinstalled OS X with wi-fi connections several times, it should work fine if your wi-fi router works with the Mac. No issues. Ethernet connection is good too if your Mac has a port, most new ones don’t unfortunately. I can get up to screen where it says ‘select the disk where you want to install OS X. Well … the install button is greyed out and i am not given any options of a disk to select. I was able to download mavericks via wifi. I’m about to attempt to do this type of recovery but here is my concern that isn’t listed in the instructions. My MacBood Pro is a late 2008 model. Does that fall under “older Macs”? It would be helpful if they listed what they consider “older Macs”. Any help with this question would greatly be appreciated. Depending on what version of Mac OS X is on the computer right now, you can try to use Recovery Mode (Command + R on boot) to reinstall. A better option may be to use a USB installer drive for El Capitan or whatever version you are hoping to reinstall. An 8 year old computer is generally ‘older’, but it depends on what OS X is on it right now as well. If you can’t install with internet connectoren them just use cmd+r it Will then boot from your recovery partition. please can anyone help with this!?? Typically if there is no drive to select, then there is either no drive installed in the Mac, or the disk is failing. Same problem. Had to Erase Macintosh HD first (which caused problem in the first place). Verify disk to assure the errors are fixed, then go back to Reinstall OS X and the disk magically appeared. Hey! 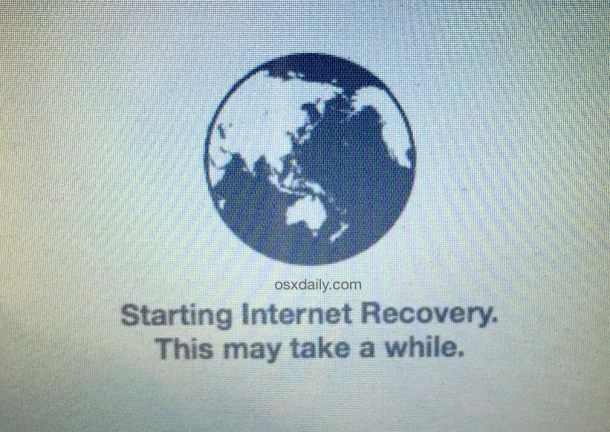 I tried the internet recovery (for a clean install) on my Macbook Pro. What happens when I click install Mac OS Sierra, and I agree to continue with the installation, a popup appears with an error about unauthorized certificates or something.. help please. During the re-installation of the OS X with internet recovery, I’ve got this message “Apple.com/support -21 06F”. Any help please?? I replaced my mac pro hard drive and I tried re-installing Mac OS X lion. It prompt me to log Apple ID account and after I got in, this is the message I got “This item is temporarily unavailable “, Try again later. Any comment I can get this resolved? same here, “This item is temporarily unavailable “ when logging into Apple ID. WTF is this? When I get to installing it says the ‘disc is locked’. There is no option I can find to unlock. Does anyone have the answer? Mine says Disc is Locked, also. Anyone figure out the problem? Thanks! after I enter my password a window came out saying “This item is temporarily unavailable” try again later , any idea why? I have a late 2011 MacBook Pro which came with OS X Lion.I have passed the step of downloading OS X, but right as the download of “additional components’ finishes, Another one restarts. I am wondering if this is because their are multiple additional components. After Internet Recovery loads and progress bar completes, it shows apple logo then progress bar. BAck to white screen again. Clarification: I bought more memory because the restore failed. Thank you for your help. I just did this recovery during installing a new hard drive and it didn’t ask me to select a wifi network just started downloading? Boot into recovery … didn’t take too long?Progress bar jumped up to about 45 minutes at one stage but in reality took maybe 10-15 of elapsed time. I remember installing software of half a dozen 5 1/4″ floppy drives so this makes me feel like I’m Star Wars …. I’ve tried holding Command+Option+R immediately after the chime and it still brings me to the Apple logo, help? ?